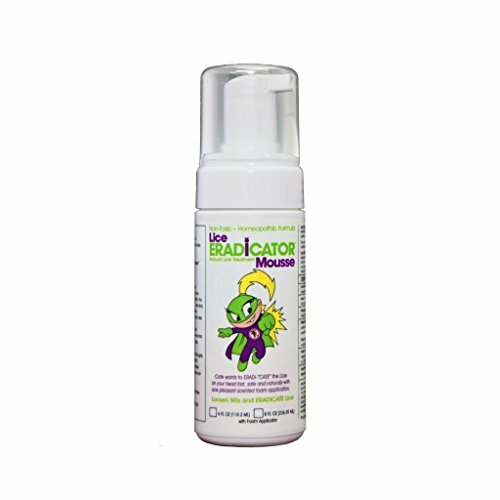 Lice ERADICATOR Mousse is a pesticide-free lice treatment product that is safe for repeated applications and clinically proven to remove irritating and unhealthy head lice infestations. One application of this natural lice treatment gets rid of head lice and the nits because the enzymes in it softens the glue that holds the nits to the hair shaft, allowing them to be easily combed and rinsed away. The "resistance factor" never becomes an issue because it kills the lice on contact. A lice comb is recommended to help remove lice eggs (nits) after the Lice ERADICATOR Mousse treatment. The head lice and nits are off the head and down the drain within 30 to 45 minutes. Lice ERADICATOR Mousse is a foam mousse for lice removal treatment and is safe for kids. This natural, non-toxic formula is pesticide free and proven to eliminate lice and nits. The non-drip foam makes application easy, allowing the solution to penetrate more effectively. This formula is prepared with pleasant smelling peppermint oils that soothe the scalp and work on nits. This product has a good track record for efficacy and is being used by many lice removal salons and services. If you have any questions about this product by ERADICATOR, contact us by completing and submitting the form below. If you are looking for a specif part number, please include it with your message. OUST Head Lice & Nit Treatment, 7.1oz - #1 PRODUCT FOR EFFECTIVE REMOVAL OF ALL LICE & NITS! Weakens the bond between nits & hair strands, significantly increasing effectiveness of lice & nit removal. Ladibugs Lice Prevent Shampoo 8oz | Natural, Essential Oils, Sulfate-free | Non-toxic, Pesticide-free | Keep Lice Away! Littlebugs Lice Prevention Kit Shampoo & Repel Spray | Natural, Sulfate-Free, Neem & Spearmint Essential Oils | Highly Effective Non-Toxic Daily Repellent | Stay Head Lice Free!